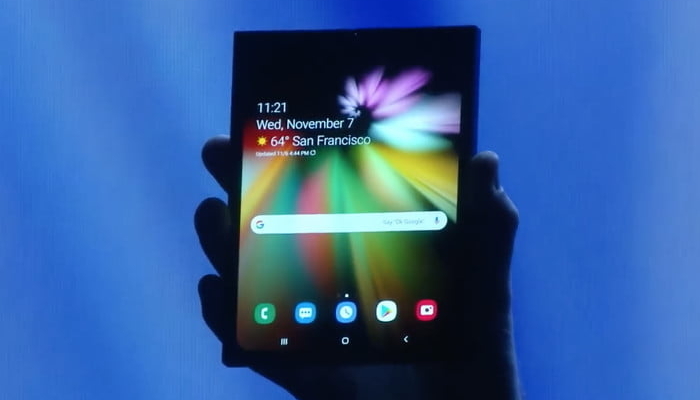 Samsung Shows a foldable Smartphone Screen. Samsung has presented its first foldable screen for phones. The user can expand the phone to use the device as a tablet. The screen was presented on Wednesday at the Samsung Developer Conference. The arrival of the folding phone has been expected for a long time. which is called the Infinity Flex Display by Samsung. The housing of the device was covered. The device can be folded up as a phone, unfolded it is a tablet. According to Samsung, the screen can be folded “hundreds of thousands of times” without difficulties. More details not disclosed. In the coming months, the screens will go into production, and it is still to know when the phone will be for sale. Samsung also declared during the presentation to open up Bixby to developers and hardware makers. Manufacturers can install the speech assistant in their apps and products. As a result, Bixby must get more functionalities and be made more useful. The assistant will be built into various devices in the coming years, such as smartwatches, tablets, refrigerators and washing machines. Bixby is also available in five new languages, but not in Dutch. Samsung also announced One UI, a new model for the operating system on Samsung phones. With the design, the interface has to be more precise and more user-friendly. Different grouping choices have simplified the settings on the phone. In the Samsung message app, chats are only shown from the middle of the screen. For example, users with a large telephone can select a call when operating with one hand. A beta version of One UI will be available this month in the United States, Germany and Korea. From January 2019 users with a Galaxy S9, S9 Plus and Note 9 can get started. Are You Looking for Bunk Beds? Grab Your Summer Deal! © 2019 - Town News. All Rights Reserved.